Office 365 Groups is a service that works with the Office 365 tools you use already so you can collaborate with your teammates when writing documents, creating spreadsheets, working on project plans, scheduling meetings, or sending email. This article will help introduce you to what groups are, and give you some helpful links to the next steps. Tip: If you're looking for information on using Outlook contact groups to send email to a list of people - such as a group of friends - see Create a contact group or distribution list in Outlook for PC. Groups in Office 365 let you choose a set of people that you wish to collaborate with and easily set up a collection of resources for those people to share. Resources such as a shared Outlook inbox, shared calendar or a document library for collaborating on files. You don’t have to worry about manually assigning permissions to all those resources because adding members to the group automatically gives them the permissions they need to the tools your group provides. Additionally, groups are the new and improved experience for what we used to use distribution lists or shared mailboxes to do. Tip: For information on upgrading your traditional distribution lists to Office 365 Groups see this article. The specific resources that are provided depends slightly on the groups experience your team wants to have. While you’re considering the options it’s important to remember that one size rarely fits all. Different teams may prefer to work different ways and Office 365 has the tools to enable collaboration in whatever form your teams prefer. You can create Office 365 Groups from a variety of tools including Outlook, Outlook on the web, Outlook Mobile, SharePoint, Planner, Teams and more. Which tool you choose to start from depends a bit on what kind of group you're working with. For example; at Microsoft we tend to start from Outlook when we're creating a Group organized around email and calendar. If the Group is for company wide communication we tend to start with Yammer. For chat-based collaboration we'd start our Group from Microsoft Teams. When creating a group you'll need to decide if you want it to be a private group or a public group. Content in a public group can be seen by anybody in your organization, and anybody in your organization is able to join the group. Content in a private group can only be seen by the members of the group and people who want to join a private group have to be approved by a group owner. Note: Currently, groups created from Outlook on the web are private by default. Neither public groups nor private groups can be seen or accessed by people outside of your organization unless those people have been specifically invited as guests. Group owners are the moderators of the group. They can add or remove members and have unique permissions like the ability to delete conversations from the shared inbox or change different settings about the group. Group owners can rename the group, update the description or picture and more. If you're familiar with SharePoint roles then a group owner is a site collection admin. Group members are the regular users in your organization who use the group to collaborate. They can access everything in the group, but can't change group settings. In the SharePoint world they are site members. For information about adding or removing group members see Add and remove group members in Outlook. Guests are like group members, but they are outside your organization. By default your users can invite guests to join your group, and you can control that setting. For more information, see Guest access in Office 365 groups. You don’t have to manually create any of those resources; creating the group automatically creates them for you and assigns the necessary permissions for your group members so they can start using them right away. You can access these resources through the familiar Microsoft Outlook 2016 desktop client, via Outlook on the web, via Outlook 2016 for Mac (shared inbox only), or via Outlook mobile. 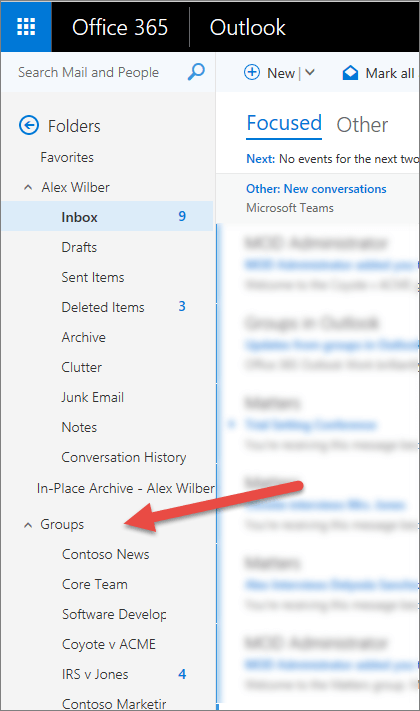 You'll find your Office 365 Groups in the navigation pane on the left in Outlook desktop or on the Web. 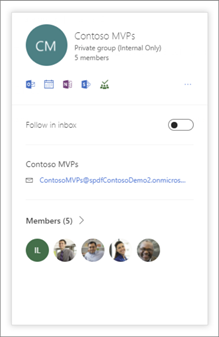 With the new Office 365 Groups hover card, you have quick access to shared group resources. Just hover over a group name in Outlook on the web or SharePoint. The newest part of our collaboration story is Microsoft Teams. Microsoft Teams is the inner loop for your team – a persistent, chat-based workspace where you can have informal, real-time, conversations around very focused topics or specific sub-groups within the group. Yammer brings the enterprise social experience to your collaboration. It helps you make new connections and discoveries across your organization. It can help you communicate and discuss ideas company-wide or around common interest areas. You can access these tools through Yammer in your browser or using the Yammer app on your iOS, Android or Windows Phone device. After a Group outlives its intended purpose, you can delete it to free up system resources and to remove the group from being listed or displayed. See: Delete a group. If you don't want to have to remember to delete outdated groups your administrator can set expiration policies that will cause old groups to expire and be removed automatically after a specified period of time. See: Office 365 Group Expiration Policy. Note: The content on this tab is intended for administrators. There are three primary models of provisioning in Office 365 Groups: Open, IT-led or Controlled. Each has its own advantages. If you want to control how your Office 365 Groups are named you can use naming policy to force Group names to adhere to certain standards including prefixed or suffixes as well as blocking objectionable names. See Office 365 Groups Naming Policy for more information. Every group has at least one owner that can add or remove members and do some basic curation of the group and its content. Usually the owner does that in Outlook. See: Add and remove group members in Outlook. If a group's owner (or owners) leaves the organization for any reason the administrator can assign a new owner to the group. See Assign a new owner to an orphaned group. Additionally, if you have Exchange Online Administrator permissions you can administer your groups from the Office 365 Admin Center (See Manage Group membership in the Office 365 admin center) or from PowerShell (See Manage Office 365 Groups with PowerShell . There may come a time when you want to delete a group from your tenant. For information on how to delete a group see: Delete a group. If a group is accidentally deleted admins can restore that group for up to 30 days, see: Restore a deleted Office 365 Group. If you prefer a more automated way to manage the lifecycle of your Office 365 Groups you can use expiration policies to expire groups at a specific time interval. The group's owners will get an email 30, 15 and 1 day before the group expiration that allows them to easily renew the group if it's still needed. See: Office 365 Group Expiration Policy. More than 1,000, though only 1,000 can access the Group conversations concurrently. 1 Terabyte + 10 GB per subscribed user + any additional storage purchased. You can purchase an unlimited amount of additional storage. The default maximum number of groups that an Office 365 organization can have is currently 500,000. If you are planning to user the feature "Group Writeback" from Azure Active Directory Connect tool, the maximum length is 448 characters related to the "Description" attribute. For more information on SharePoint Online storage see SharePoint Online Limits and SharePoint Online software boundaries and limits. Managing your Office 365 Groups is more effective when you actionable information about Groups usage. The Office 365 Admin Center has a reporting tool that can let you see things such as storage use, how many active Groups you have and even how your users are using the Groups. See: Office 365 Reports in the admin center for more information. Office 365 Groups gives you a number of tools for compliance, information protection, and eDiscovery as well.